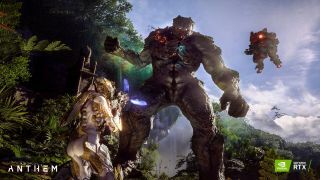 Anthem has been graced with the previously promised patch which adds support for Nvidia Highlights as well as DLSS – along with a number of major gameplay tweaks – and Nvidia has been boasting about the big difference the latter makes for GeForce RTX graphics card owners. For the uninitiated, DLSS is Nvidia’s tech which allows RTX GPUs to benefit from boosted frame rates, as well as better image quality, a delectable double whammy of upgrades (although the technology has had its teething issues early on, with the first supporting games). According to Nvidia’s own testing, DLSS delivers up to a 40% frame rate boost in Anthem. You can see the exact gains across the range of RTX cards in the bar chart below. So, there’s an impressive boost for the most affordable RTX graphics card, the 2060, which moves up from a rather stutter-laden 27.9 frames per second (fps) at 4K resolution, to a considerably smoother 38.9 fps. And the RTX 2080 shifts up from around that level – 39.5 fps – to 55.4 fps with DLSS turned on, which is almost at the magic 60 fps mark. Bear in mind that these figures were benchmarked on a high-end rig, running a Core-i9 9900K processor with 32GB of system memory. The game should look better with DLSS, too, as illustrated in the video below. Nvidia observes that DLSS kicks in to give the most benefit when the graphics card is under maximum load. As well as patch 1.0.4 for Anthem, you will naturally need to be running the latest GeForce drivers, and also note that you must be on Windows 10 October 2018 update, too. It’s also worth bearing in mind that you need to be running 2,560 x 1,440 resolution (which is supported with the RTX 2080, 2070, 2060) or 4K resolution (which is supported across all RTX graphics cards). You can turn on DLSS from your GPU’s Video Settings, under Display Settings, where you will see the switch. Another bonus with the new Anthem patch is that the game now supports Nvidia Highlights, whereby impressive in-game moments are automatically recorded as short video clips. So, for example, when you kill a dungeon boss, or when you achieve more than eight kills in space of 10 seconds, that will be automatically recorded and saved as a highlight. After your game session, you can then easily edit and share these highlights, which is all pretty nifty. As we mentioned at the outset, this patch also brings a lot of gameplay changes to Anthem, which you can read more about here. Also worth noting on the PC front is the fact that a FOV (Field of View) slider has been introduced, with a variety of different FOV settings to play with.